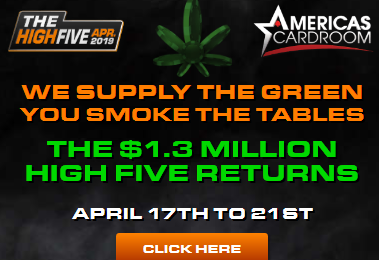 Americas Cardroom next Online Super Series….. I came up with a few details. 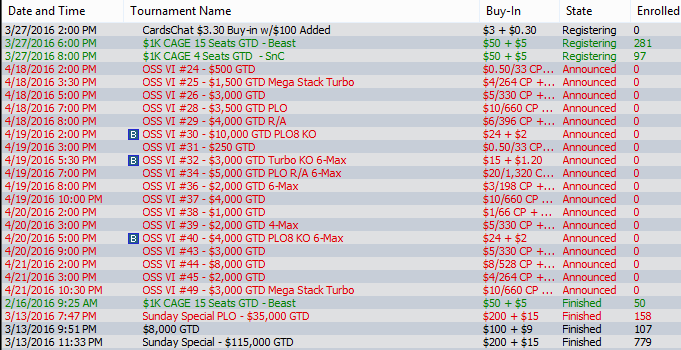 Here is a partial schedule, already posted on the Special Tab on the ACR Tournament Lobby, I’ll be adding the complete schedule as soon as it is posted……..
You can already see a variety of affordable Buy-ins and Guaranteed prize pools. The OSS 6 should be bigger and better than than ever on ACR. Make sure you use your new player Welcome Package when you sign up to ACR for OSS VI today…..
That’s $75 of play for $25 plus your 27% rake back and 100% Deposit Bonus (up to $1000). The OSS VI will culminate with OSS VI #70, a $1 Million Dollar GTD poker tournament as the Main Event on April 24th at 4PM ET. Americas Cardroom is not limited to US only Players, (it is the best place to play for US players, however). Players world wide are always welcome and will enjoy the expansive tournament schedule and generous New Player welcome package (no other site will give you as much, for so little). Visit ACR Now for your $50 in Free Tournament Bucks, 100% (up to $1000) Bonus and 27% Rake Back (paid weekly).